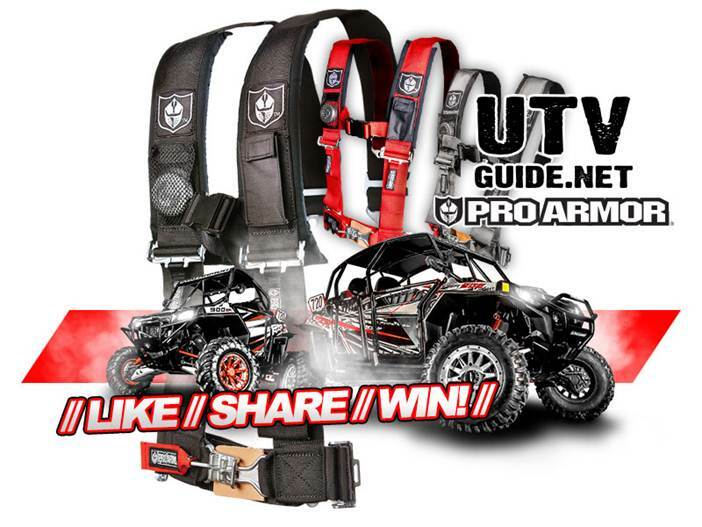 Pro Armor and UTVGuide.net have teamed up to giveaway a set of Pro Armor Harnesses. It is easy to enter and the winner will be selected on April 19, 2013. Win – Winner selected on April 19, 2013. International will need to pay fee for shipping. Winner has their choice of a set of 2″ or 3″ Pro Armor Harnesses in red, black or grey. Pro Armor now offers 4 and 5 Point Harnesses. They feature 2″ and 3″ harnesses with sewn in pads & a water resistant cell phone pocket to hold your iPhone, Droid or MP3 player. The belts also come with a Free LED Flashlight (mesh pocket for light with velcro closure) & adjustable sternum strap. These harnesses are also easy in and easy out due to the fact the shoulder harnesses are sewn to the lap belts so less hardware & hassle for the latch and link system. All Pro Armor harnesses have been tested and passed SFI standards, and the 3-inch 5-point harnesses are SFI certified for racing. You can find us on the web at www.ProArmor.com and www.UTVGuide.net. Thanks for participating.